I think today may have been wetter than the Campbeltown leg, and that’s saying something. 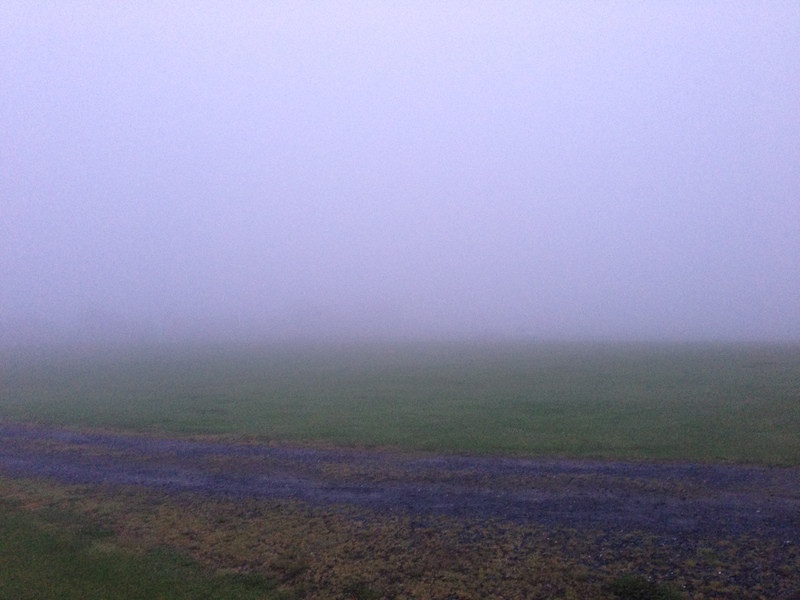 The visibility was definitely worse, with low cloud hanging about for much of the day. My tent was shaking when I woke up. The wind had changed direction in the night and was blasting the side, accompanied by the persistent drumming of rain. 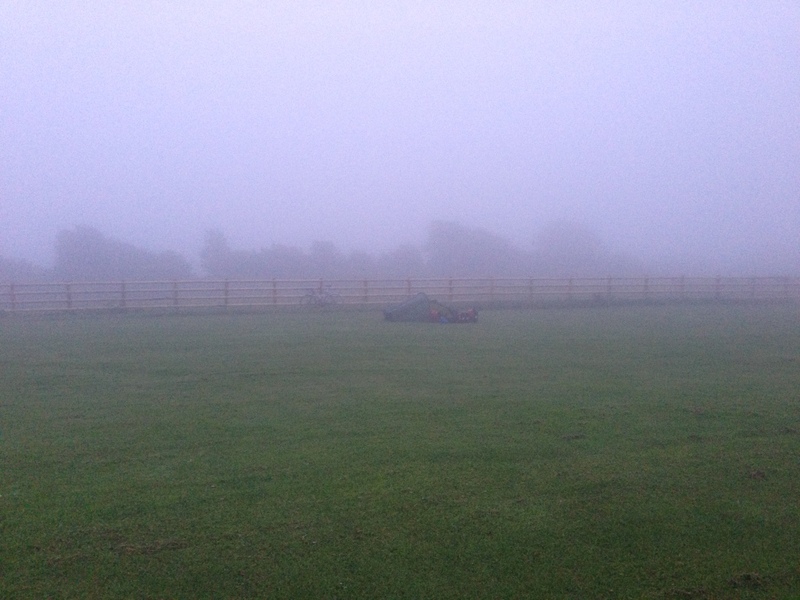 ‘Great,’ I thought, so much for the good weather of yesterday. Determined to get a good leg in I breakfasted in my tent, then made a dash to the toilet block and showers. Thankfully the rain stopped whilst I packed up and I was on the road by 10.00. In hindsight I’m not really sure why I bothered with a shower. From Herbranston I made my way to the town of Milford Haven, dodging through the traffic to join the B4325 to Honeyborough, where I knew there was a bike shop. There were some pretty big ships out on the water, Milford Haven having been used as a port since the Middle Ages. I stopped at Enterprise Cycles, a Ridgeback stockist, and bought some new brake pads (Aztecs). The shop staff were very helpful and obliging – they let me bring my bike in and change the pads in the shop, so I spent 10 minutes adjusting them to make sure they didn’t rub etc. I was doubly grateful when it started to throw it down outside, and prolonged my visit to have a good chat about my tour and cycling in general. The rain however didn’t look like it was going to stop, so I eventually bid Enterprise Cycles goodbye and pedalled off to the bridge over the Milford Haven. The busy bridge crosses at Neyland over to Pembroke Dock, and thankfully there’s a cycle path that runs over it. There were a lot of heavy trucks out on the road and kicking up a lot of spray, something of a feature for the day, so I didn’t take that many photos. 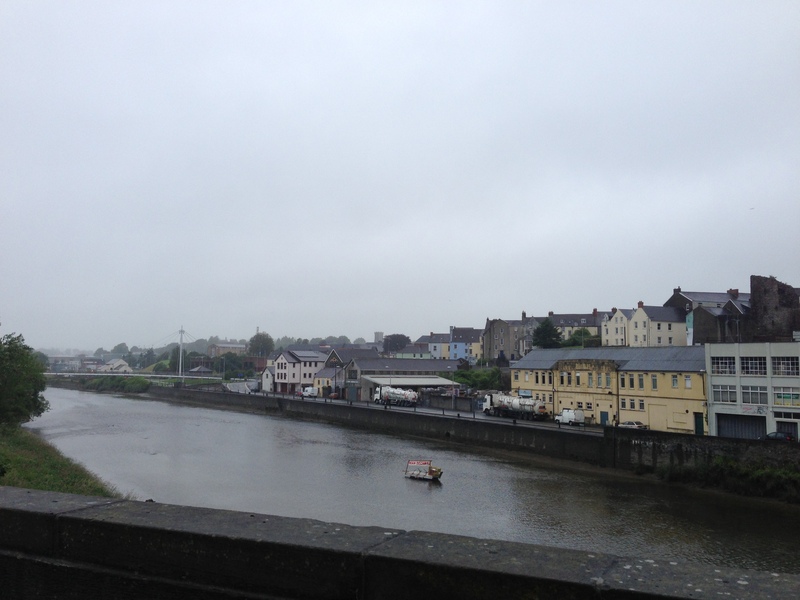 Once over the bridge I stopped for lunch in Pembroke, next to the castle, wolfing down a coronation chicken baguette. 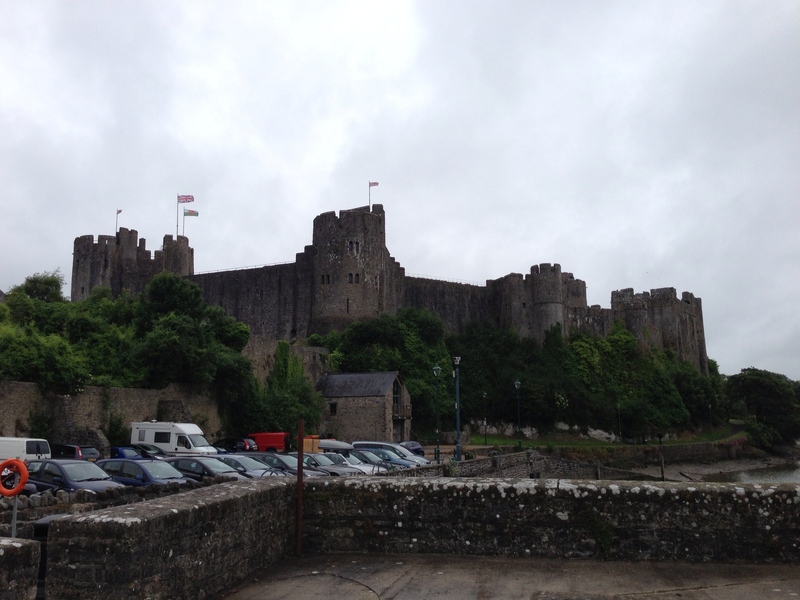 Pembroke Castle is another that’s seen a lot of action, most recently in the English Civil War when Cromwell laid siege to it. Henry VII was also born there. Post lunch and a chat to my Dad to check on the weather forecast, which didn’t sound hopeful, I got under-way again. 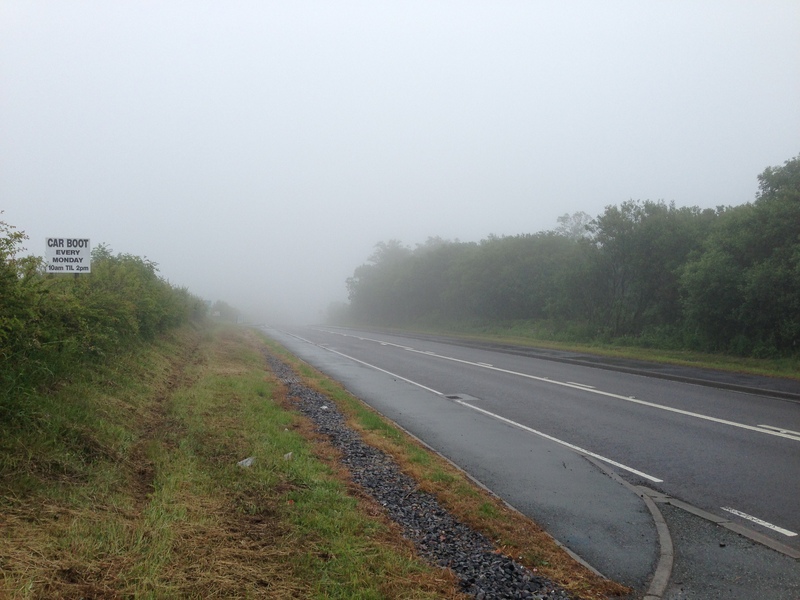 I’d intended to ride from Pembroke to Castlemartin, then back east, however due to a combination of poor visibility and bad map reading I took a more direct route to Stackpole. I wasn’t overly upset as I couldn’t see a great deal anyway, and the weather was deteriorating further as the day went on. A succession of feisty hills, including a few 16%’ers, left my legs aching after yesterday’s efforts, however at least the roads were much quieter as I pedalled along the coast towards Tenby. It’s an interesting town, built on a hill, so I stopped for a quick look around. 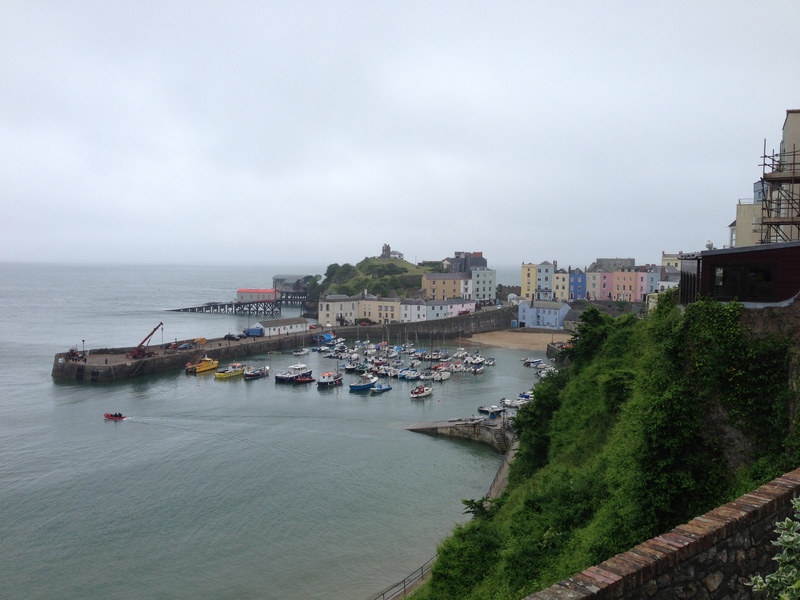 Tenby, which in Welsh means something like little fortress of the fish, is a walled town, the walls having been built to keep out a succession of Welsh attackers. It was originally a hill fort, which the Norman’s converted into a stone castle, with extensive town walls built in later centuries. The strong defensive position meant a busy seaport sprang up, and Henry Tudor had a brief stay there before sailing into exile in France, during the Wars of the Roses. 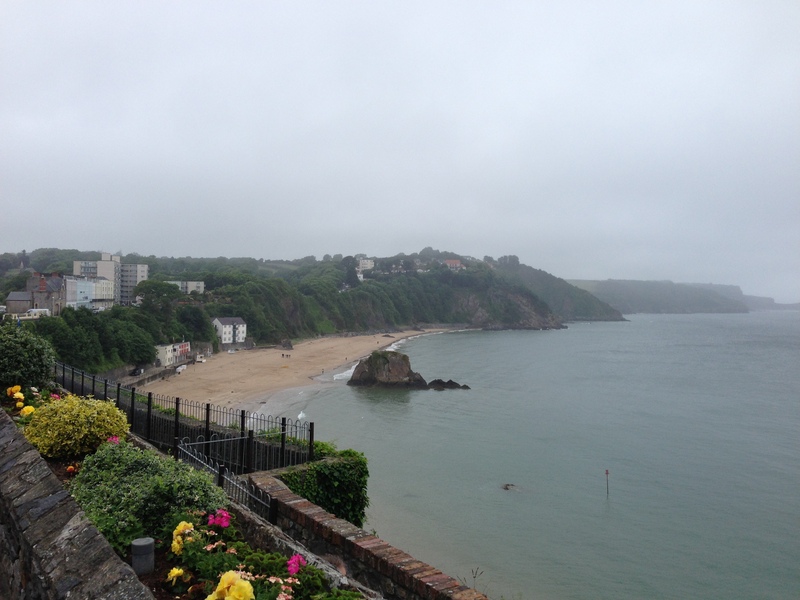 It was an impressive town despite the weather, with the harbour down below, and a nice old-town. I stopped for a coffee (decaf as usual, although I was sorely tempted with some caffeine today) at the Vista Cafe, which has great views across Camarthen Bay. Chatting to one of the guys serving I learnt he’d kayaked across Scotland, which is no mean feat given you have to do quite a bit of portaging. He did however manage to break his kayak in doing so, which was on loan from Uni, oops; now he absolutely has to finish writing up his experience as payback. I wonder if he’s finished yet. It’s amazing who you randomly meet, and how many people have had some pretty awesome adventures. Post coffee I walked my bike around the last bit of Tenby in the rain, and heard a child say, ‘Look Mum it’s snowing.’ I almost wouldn’t have been surprised if it had been snowing given all the other weather Wales had been experiencing, but it was just lights from a car reflecting in the raindrops that made it look a bit like snow. Next up was a long and pretty unremarkable stretch up to Carmarthen, via St. Clears to get over the River Taf, during which I benefited from a tailwind. I couldn’t see a lot and wanted to press on, so stuck to the main roads for a bit. With low visibility and lots of traffic I was getting a bit concerned about a lorry not seeing me, so I attached just about every light I had to the back of my bike, lighting it up like a Christmas Tree. One high point was a lovely long descent from Red Roses that seemed to go on for miles. Despite my waterproof I was pretty drenched by this stage, from the rain, mist and spray, so was quite enjoying splashing through all the puddles at high speed; I couldn’t get any wetter! I love Ortlieb Panniers incidentally, they don’t leak. I managed to avoid most of the busy A40 by taking a minor road that ran almost parallel to it, and made it to Carmarthen where I stopped for a burger to refuel, before crossing the River Towy. I shared a moment or two with a motorcyclist at the services. We were both equally drenched, and got further drenched when water suddenly ran off roof onto our heads whilst we were parking our bikes up. It was just funny by this stage. 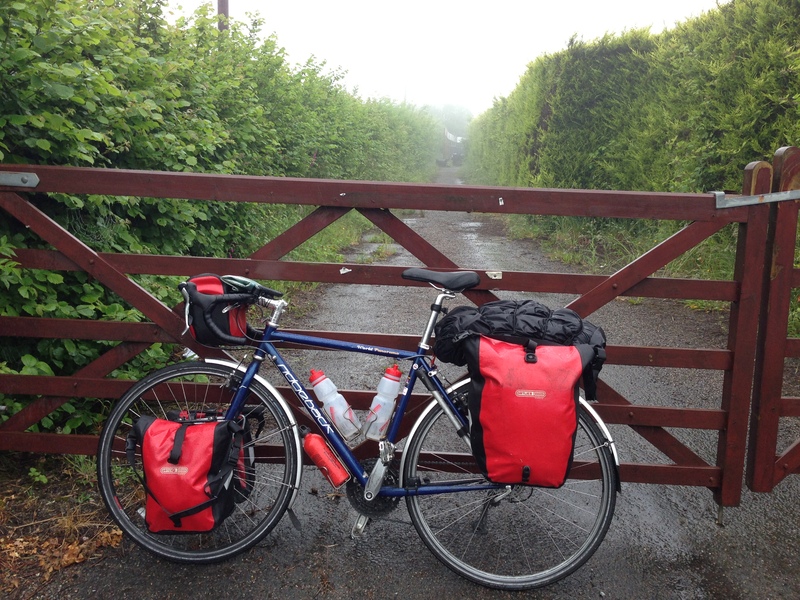 Riding through low cloud and unrelenting rain I pedalled onwards down the A484, stopping to phone a campsite in Llanelli to let them know I was coming. I was doubtful they’d be filling up with enthusiastic campers but you never know, and didn’t want to have to find somewhere else. I’ve been told the countryside and coastline is wonderful around this part of Wales, but I really couldn’t tell you if it was or not; there were certainly a few good hills and nice descents, but I couldn’t see a lot. 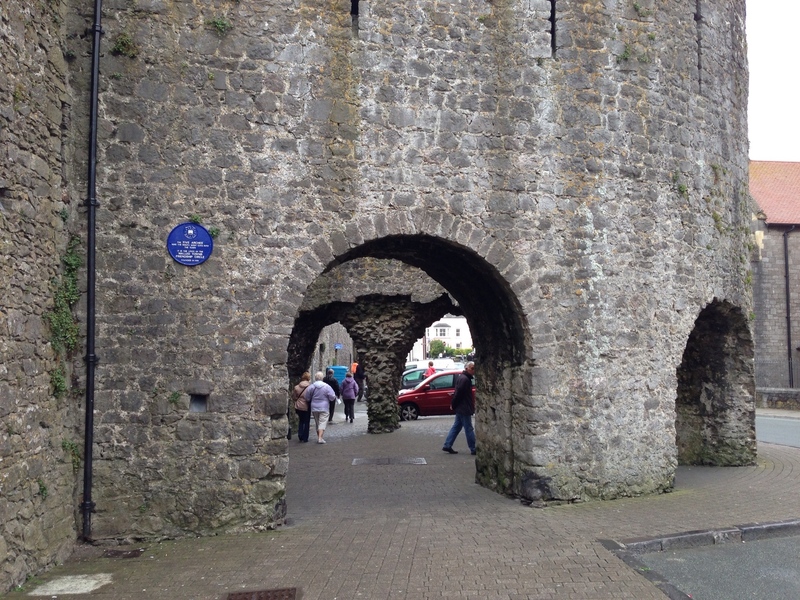 I passed by Kidwelly, and noticed a sign to ‘Pinged’. I don’t know if it was the village name that made me glance down at my rear wheel, or if I herd a ‘Ping’ at the same time, but in any case my back wheel had developed a buckle as another spoke had gone. It wasn’t too bad so I decided to leave off replacing it until I got to the campsite. It made me laugh though, and a strange coincidence – I might have been going a bit strange by this point in the day. I pedalled on through Pembrey, and round to Burry Port, before arriving in Llanelli in a dry patch. I stopped to buy some biscuits, ginger nuts of course, as well as a few beers, dripping water on to the floor of the convenience store as I waited to pay. It was one of those moments when you’re in a hurry to get somewhere, but no-one else is. The person in front of me, who was slightly inebriated and irritating the shopkeeper, spent a good 5 minutes chatting and getting his change out to pay, whilst a puddle slowly formed around me. I tried to help and we got there eventually, the man staggering off with his trusty bottle of dubious cider (White Lightning I think) and a half dozen eggs; a good balanced diet. Supplies successfully purchased, and with the convenience store’s floor inadvertently washed, I climbed out of Llanelli to Furnace, and to the Caemawr Farm Camping and Caravanning site. The farm dog, a springer spaniel, came out to great me enthusiastically and the owner showed me up through the mist to the camping field. It’s a nice site, I think, I couldn’t really tell, but the owner was very nice. There were a few other indistinct shapes in the mist which were either herds of vengeful sheep out to get me, or other campers, I hoped the latter. I got my tent up quick, which was fortunate considering it hammered down with rain about 20 minutes later. It was only 21.00, but I retreated inside for the rest of the evening, the rain not showing any signs of stopping. Handily, and for the first time in ages, I could pick up a 3G signal so had entertainment for the evening thanks to my iPad, which I can hotspot to the Internet via my mobile phone. One issue of being in a small tent is that it’s quite tricky to dry stuff. Body heat is effective but uncomfortable, and I knew I’d be putting on wet stuff tomorrow. Still, the weather forecast looked like it was going to be a better day tomorrow, and I was aiming for Cardiff where I’d be staying with friends, so could dry stuff there. 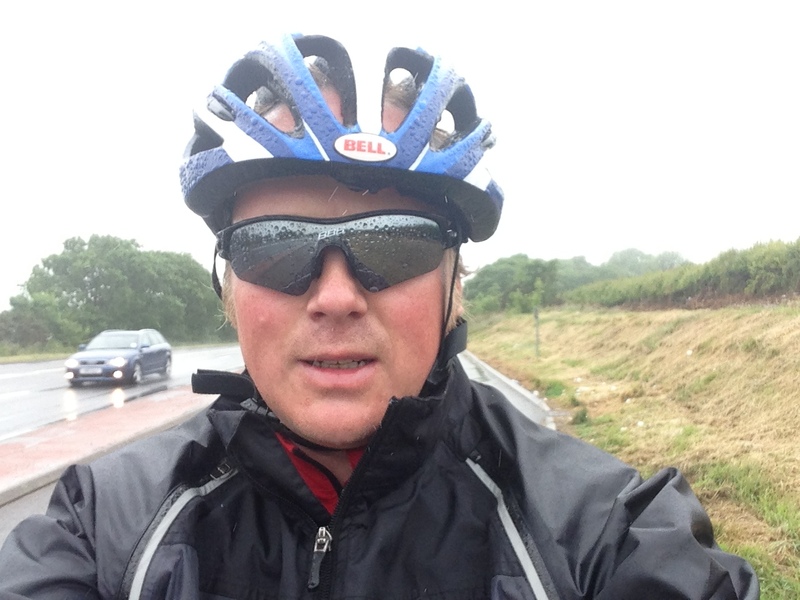 I’d covered around 75 miles today, a respectable distance considering the conditions – I was still on schedule. This entry was posted in Bike around Britain 2013 and tagged adventure, bicycle, bike, Bike around Britain, charity, countryside, cycle, cycle touring, cycling, expedition, fundraising, outdoors, Tenby, Wales on September 3, 2013 by SelfPropelled.